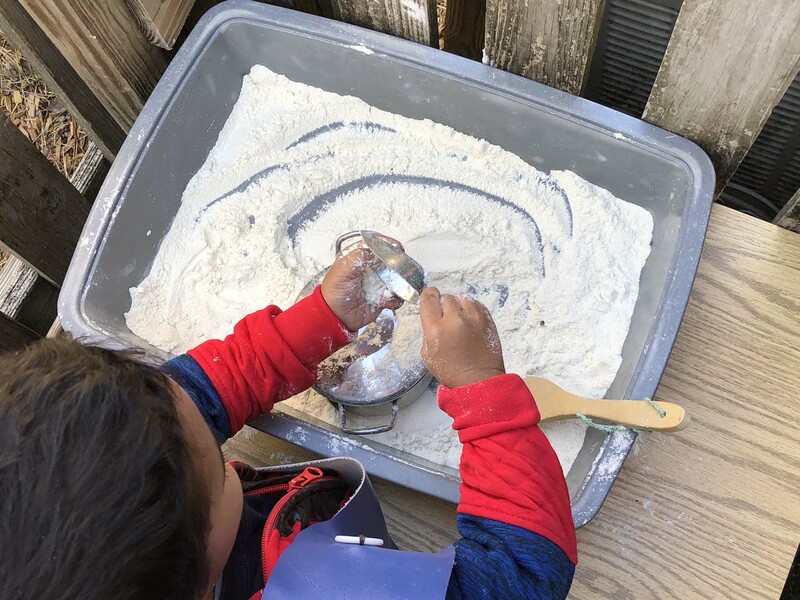 Activities, such as flour in the sensory bin, change each month in the Toddler classroom. Each month when I open the box for renewing the themes in the classroom, I get super excited! 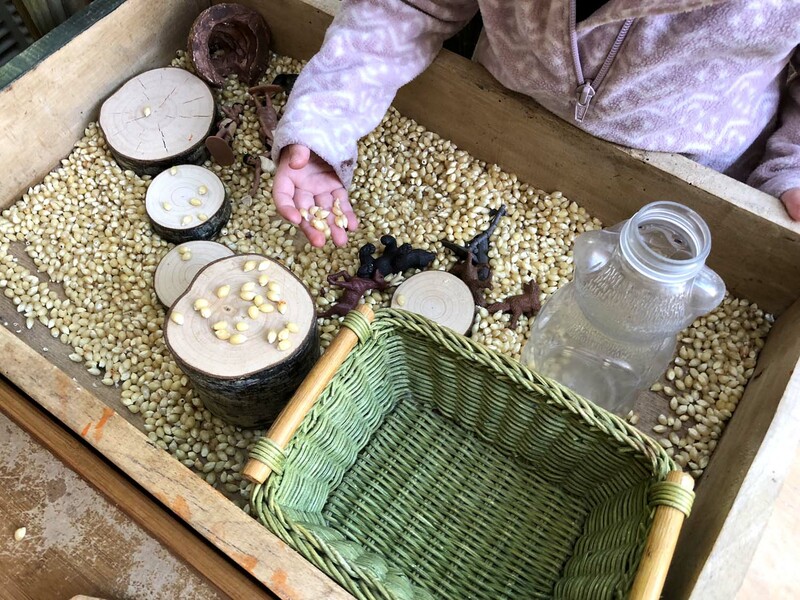 The objects that I’ve collected over the years and the activities created to draw upon the interest of the child has energetic momentum for me. November in our class is about food, turkeys, Native Americans, fall leaves, squirrels and nuts. It’s a lot of little fall bits, all sort of related. We have flour in the sensory bin with pots and pans. We also have cards with vegetables to match and post. We sing songs about leaves, squirrels, turkeys, and food. Eric Carle’s book “Today is Monday” usually becomes a November favorite. The book suggests “Monday-Green Beans, Tuesday-Spaghetti, Wednesday-Soup, Thursday-Roast Beef, Friday-Fresh Fish, Saturday-Chicken, Sunday-Ice Cream, All you hungry children, come and eat it up” The pictures may keep a toddler’s attention suspended just long enough to view each page as we (mostly I) sing along. This fall toddler activity includes corn and figures of Native Americans and animals. On Monday, Nov. 19, we invite each child to bring some (organic) vegetables to school because we’ll make soup. All toddlers will be invited to help with the washing and cutting of the vegetables, which I’ll take home to cook into a soup that we’ll have for snack on Nov. 20. Instead of assigning each child a particular vegetable, I’d like for you to send something that you already have. For example, one beet, a handful of fresh green beans, an onion, a carrot or two, a stalk or two of celery, a can of organic beans, and one or two potatoes. Any vegetable will do, and with a cube of organic vegetable bouillon, the soup always works out. Twirl around, twirl around, and all fall down together! Air my breath and Fire (Clap hands to create a “spark”) my spirit! Did I put it in my pocket? No. No. Did I put it in the ground? No. No. Did I put it in the my back pack? No. No. Did I put it in the ground? Yes. Yes. I’m a little busy squirrel, digging in the ground. Digging, digging, digging, look what I found! Fill in your own movements. Here are my friends, and here am I. Each toddler has a space for a jacket and work on learning how to put it on. When the weather turns cold, and coats become part of our daily wear, consider practicing this coat flip with your children. Lay the open jacket on the floor, the inside facing up. Have your child stand by the “hood,” “collar” or “tag.” Those are some clues that are easy to remember. The child puts a hand in each arm hole, and then flips the coat on, over his head, moving the arms up, then spreading them wide. 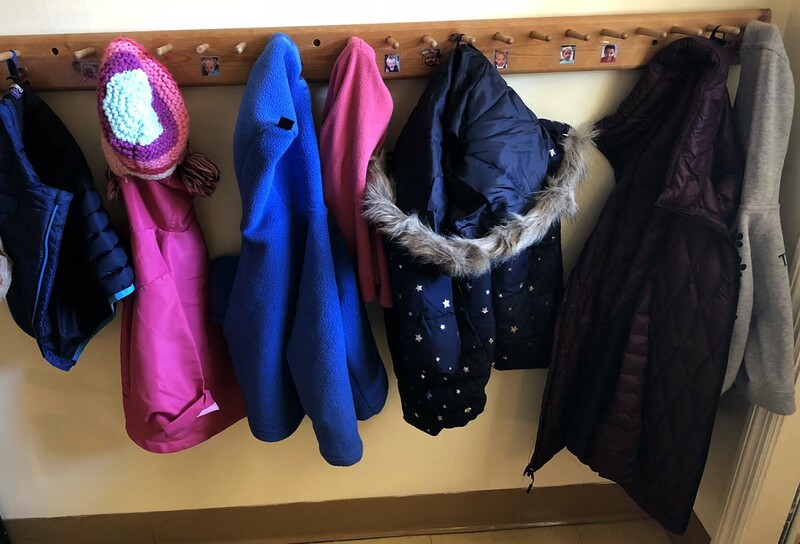 Coat flips may take some time to teach, but, with a little practice, your child will soon be able to put on his/her coat all by him/herself. See the video demonstration below.